Funeral services can immensely help families with their emotional, psychological, and spiritual journey from grief to healing. A truly personalized funeral service can provide deep meaning and value for families who are organizing it and for those attending. They provide an opportunity to honor the life and receive the gift of cherished memories of the person who passed. The style of the service can be traditional or unique, customized to compliment the life and wishes of each individual. 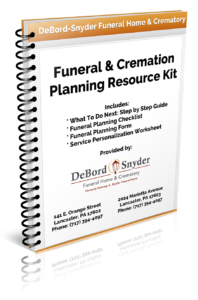 At the DeBord Snyder Funeral Home & Crematory, we will present all your choices and cost considerations, and work with you to fulfill the particular needs. A funeral is a unique event in the life of a family. Just like no two lives are the same, no two funeral services are exactly alike. Still, each is an experience of value, filling several important needs, and funeral home services can offer compassionate yet professional assistance in such naturally trying times. A funeral service provides certain closure for the survivors and helps them to acknowledge the passing and face the reality of death, which is the first step toward expressing the grief through mourning. It also allows families, friends, and community to show and receive support during this difficult time. Together, close friends and relatives can offer encouragement and consolation when they are needed the most. The funeral service is also a celebration of a person’s life, an opportunity to reminisce and pay special tribute. Its personalizing should be as unique as the individual, providing a focal point for remembrance. DeBord Snyder Funeral Home & Crematory funeral directors will work with your family to honor and remember your loved one by creating a service that fits your beliefs, culture, and financial means. Burial Package Options include: Complete Funeral Service with Casketed Burial, Graveside Service with Casketed Burial, and Green Casketed Burial Package. Providing memorable and meaningful funeral services includes different types of cremation services, allowing for a private farewell to the loved one. Cremation Package Options include: Signature Cremation Packages at our On-Site Crematory, Viewing and Service Followed by Cremation, Cremation Followed by a Memorial Service, Cremation Followed by a Graveside Service, and Simple Cremation. Whichever form of service you choose, we will provide your family with a respectful, caring, personal, and meaningful service. We invite you to call our helpful staff at our Lancaster Location (717) 394-4097 to learn more about DeBord Snyder Funeral Home & Crematory funeral services.